“where two or three are gathered in my name, there am I with them." 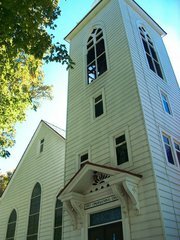 Click here to see our sanctuary. Our church is known for its beautiful stained glass. Click here to see it. 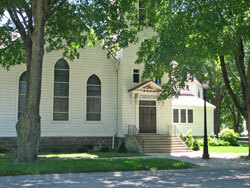 Worship at First Congregational United Church of Christ is a blend of tradition and innovation. We are a community that welcomes all the worship – and all to witness. As a congregation within the United Church of Christ we are a congregation that engages all with the spirit of Christ and the presence of God. Our service is a space where people of all ages, beliefs, practices and identities, are welcome. Come as you are – whether this means formal or informal, dressed up or dressed down, and experience the love of God and the presence of Christ. Children are a valued part of our community. They are always welcome in worship and to engage in the spirit of worship – whatever form that takes. As Jesus said “Let the little children come to me, and do not hinder them, for the kingdom of God belongs to such as these” (Luke 18:16). We love the voices and energy of children in worship. We also recognize that there are children (and parents) who may wish to have a break from worship or who need to encounter God and the love of Christ in a more active manner. A nursery is available during worship and children are welcome there for all or part of the service. We also have busy bags available for those who would like something a bit more active during the service. Our worship service is a place where all are welcome and where we encounter God through Christ in prayer, music, scripture and fellowship. Come and experience God's love and the grace that is present in the church. We celebrate communion several times a year with both wine and grape juice so that all can partake. All who identify within the broad family of Christ and Christ's church are welcome at the table. Children are welcome under the guidance of their parents. We worship at 10am on Sunday mornings. We have also experimented with more contemporary style evening services, and we hope to do more of these in the future. We look forward to seeing you soon!